Nimbuzz is a free instant messaging application which combines several messaging platforms and social media services in to one program. With this program, you may also may an unlimited number of Voice-over-IP telephone calls, video chat conferences, audio calls and even share files between parties. 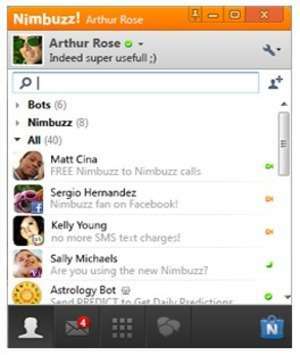 With Nimbuzz, you can connect to MSN/Skype, Gtalk, Yahoo and Facebook. Not only can you use this application on your PC, but it also fully supports many mobile platforms include iPhone, Android, BlackBerry an Windows Mobile. Version 2.9.5 is a freeware program which does not have restrictions and it's free so it doesn't cost anything. For security reasons, you should also check out the Nimbuzz download at LO4D.com which includes virus and malware tests. Additional screenshots of this application download may be available, too. Read reviews and download some of the most popular messenger (IM) applications for Windows. Also included are messenger addons and fully-fledged clients. Check out some of the freeware downloads available in the i.m. client category. They contain no strings and are available at zero cost. Nimbuzz download been highly rated by our users.